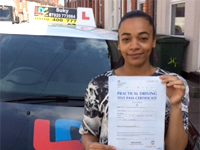 Within the space of 30 lessons I passed first time with Suky. 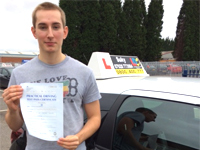 Suky is a excellent driving instructor who helps build your confidence making driving fun and easy. At times when I made mistakes she gave me positive, clear and constructive feedback allowing me to tackle these issues and become a better driver. 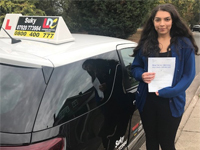 Aswell as being a great instructor, you develop a friendship with Suky which made me feel comfortable enough to ask her plenty of questions to help my understanding and gaining in-depth feedback to improve my driving abilities. 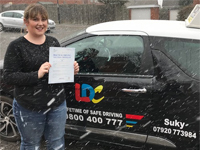 She even goes the extra mile by tailoring lessons specifically to your needs and by sending videos to help understand certain aspects of driving ready for the next lesson. Her patience, clarity of feedback and the bond you have with her sets her apart from all the other driving instructors. I would highly recommend Suky to any learners out there. Thank you very much Suky for all the great lessons. 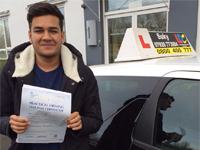 I just want to say, a great big thank you to Suky for helping me past my driving test first time with no minors. Suky was my last hope to find a love for driving, as I lacked confidence from my previous instructors, due to the way they taught, and she did not disappoint! 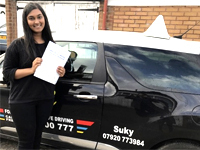 Suky is truly remarkable with the amount of patience she has and the ability to teach in a memorable way, helping you achieve the skill of driving. Learning to drive is one thing, but to be able to enjoy each and every lesson is another! 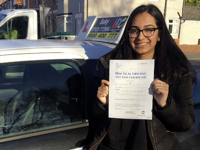 Suky helped built confidence in myself and my ability to drive as she is reassuring, honest and calm which is perfect when learning to drive. Suky was there every step of the way and adapted her teaching to suit. I am definitely going to miss Suky and her bubbly personality which is infectious. I honestly have thoroughly loved my time learning to drive and I have now found the confidence to drive independently. Thanks a million! span>I would recommend Suky to anyone for driving lessons. She is the perfect combination of funny, relaxed and stern(!) She not only gave me the utmost confidence from the first lesson, she also made it so fun. The thought of driving previously seemed like a chore, but after a couple of lessons I found myself actually looking forward to it. It’s one thing teaching someone to drive, but another to give them enjoyment in it, which is what Suky does effortlessly. Each thing is explained perfectly and by the test you feel as confident as possible, in that she’s covered everything, & possibly more! I will genuinely miss her lots. Suky is the easiest person to get along with and I couldn’t have had a better time learning how to drive with her. From day one, my lessons felt natural and progressive, and I was always given advice in a supportive way. I had to take a few long breaks during the time I was learning, but she was very accommodating towards this and I always felt comfortable getting back behind the wheel, even if it had been a while. I really recommend taking lessons with Suky. Not only will she break down driving for you and make all of it seem less daunting, but your lessons will be great fun and she’ll put you at ease every step of the way. Thank you so much Suky! I’ll really miss our lessons. I want to say a huge thank you to Suky for being such an amazing driving instructor for me. After leaving my last instructor, I was recommended Suky by a friend of mine after feeling I was not making any progress and not feeling confident at all in my driving capabilities. From taking lessons with Suky, I had felt a lot more confident and I had learnt a lot from her very quickly as we were covering all the the mistakes I was making before and looking over them in depth from all the small mistakes to big ones too. 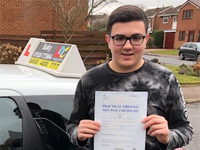 I was reassured by Suky in my situations where I wouldn’t feel very convinced with, especially on busy roundabouts, but going through the issue constructively, I had felt very self assured straight away. We were also looking at test centres in depth and I was put under mock exams, making me feel more prepared as my driving test had approached. 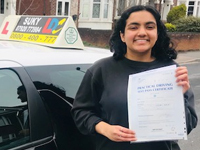 One of the best things about having Suky as an instructor is that she was very understanding, humorous and a lovely person to be around when driving, always making me feel comfortable when driving, therefore giving huge strides of progress as each lesson went by. I will highly recommend anyone to Suky and I’m so grateful to Suky for making me pass my test and being a good driver! I was recommended to Suky via a family friend. After failing twice with a previous instructor I decided a change of instructor would be best. When I met Suky I explained my situation and what qualities I thought my previous instructor lacked. She took all these on board and helped my driving immensely. She covers every little bit of detail and explains any big or small mistakes you may make in a way that you will understand. I had much less than 20 lessons with her and passed with great confidence on my test day. Suky is friendly, flexible, engaging and has a professional and effective teaching method. I highly recommend her whether you're just starting or whether you're changing instructors like me. Thanks a lot for all your help and I'm so excited to drive on the roads! I have to say with no exaggeration at all this lady right here is an awesome instructor! From my first lesson to the day of my test she assured me that I could do it! Suky helped me fight my parking monsters and was able to teach me how to accurately park, I had struggled understanding the basic logic behind parking for such a long time! Suky has the unique ability to simplify driving with her handy tips, which gave me the confidence to pull it off! A word of warning though don’t be fooled by her quiet demeanour she can switch it up on MOCK TESTS when she becomes the feared examiner with a flick of a switch!! With all honesty this is exactly what you need to prepare for your actual test. Suky is a great teacher, with an excellent balance in her teaching method! Thank you, we did it! 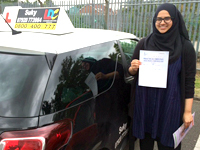 I would definitely recommend Suky as she helped me pass my driving test first time. We covered many test routes so I was well prepared for my test. She’s also a friendly and funny instructor so every lesson had with her is as comfortable as it is helpful. Criticism was always given in a constructive rather than harsh way so it doesn’t knock your confidence as a driver. I’m really happy I went to Suky and I’ve already recommended her to my friends! I owe it all to Suky Badhan for being such a great driving instructor. She helped me to build up my confidence and overcome my nerves as my driving test was approaching. I would definitely recommend Suky! I am glad that she was able to provide me with all the lessons that I needed. She is a patient and reliable driving instructor. I am so excited to get on the road! All thanks to Suky! 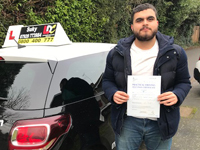 There were absolutely zero faults when it came to being taught by Suky, everything was covered in depth, and so there were no unexpected obstacles on my test. 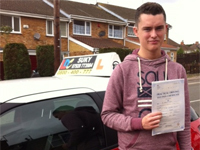 My driving lessons were enjoyable, and I looked forward to having them every week. 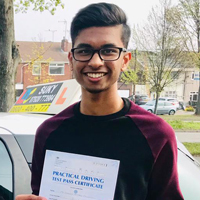 Suky’s was the first car I stepped into, and I passed in under 20 lessons, with only 2 minors, thanks to all the help and advice provided to myself. From day one, my confidence was boosted and I could take my lessons with great flexibility. Her knowledge of the different test routes was extensive, and all were completed with ease because of the clear instructions given. She has a professional approach, a great sense of humour, and is one of the most kind hearted and selfless individuals you will ever meet. I am extremely grateful for everything she has done and am proud to say I have had the opportunity to be taught by Suky. I highly recommend her to anyone looking for an instructor, and would like to thank her again for the valuable life skills learnt. 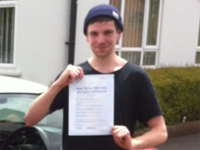 First of all a massive Thank You to Suky for helping me to pass my driving test first time in just over 6 months! She is a very friendly and calming instructor and built my confidence quickly. Flexible with lessons that fit around my work and university timetable. I felt well prepared and calm for my test and that would not have been possible without her help! I would recommend Suky 110% to anybody who wants to start learning or even restart learning like I did! Thank you again and see you around! 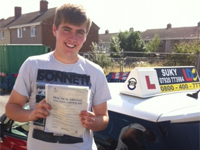 I would like to thank Suky for being an excellent driving instructor, of which i passed first time with only 15 lessons. 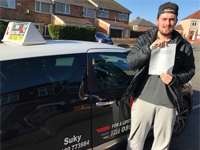 Suky makes you feel very comfortable and gives you the confidence needed to pass your driving test as i was well prepared and very calm thanks to some great help. 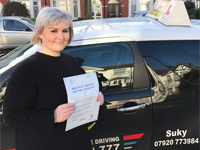 I would definitely recommend Suky to anybody who wants to start driving as she is very reliable and works around your lifestyle perfectly and is very understanding to any issues that may occur whilst learning. Thank you so much Suky, see you on the road :). 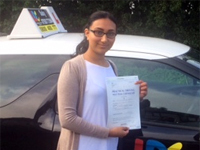 A massive thank you to Suky for being an incredible driving instructor and helping me pass first time. 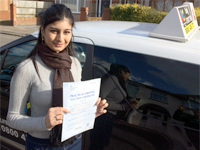 Suky is an easy-going and supportive driving instructor, with an amazing personality. Throughout my experience, she provided clear and constructive criticism, in a positive and encouraging manner. Suky was recommended to me by multiple friends and gave me the confidence and skills to become a better and safe driver. I'm so glad I decided to go with Suky and I would highly recommend as I couldn't have done it without her! Thank you! Been learning since May with Suky and we’ve built up such a great friendship, she was a great instructor who keeps you calm and confident. I would get nervous every time I had my lessons but as soon as I got into the car them nerves would go and that’s thanks to Suky. I would recommend her to everyone, she’s really understanding, funny and doesn’t put pressure on you when driving. I’m definitely going to miss our lessons and weekly gossip but I know I have met a friend for life. Thanks I couldn’t have done it without you. 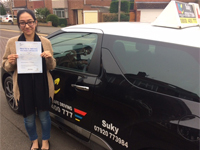 My driving experience was made easy with thanks to Suky. She is a calm, positive and experienced instructor who taught me everything in detail. I looked forward to my lessons as every lesson was about learning something new! She gave me confidence as well as being extremely supportive. Suky is an amazing instructor who gives perfect advice on improving your faults and I would highly recommend her to anyone. I will definitely miss not having any lessons with her! Suky was recommended to me by a friend of mine which I am very glad about. A massive thank you to her as she is an outstanding instructor who keeps you very calm and is very reassuring. She explained everything step by step which made it easy to learn and also gave constructive feedbacks which helped build my confidence when driving. She made it easy to fit lessons around my busy work schedule. Suky’s an easy going person with a fantastic personality. I would highly recommend her to anyone looking for a driving instructor. I will definitely be recommending Suky to anyone needing a friendly, patient driving instructor. She taught me how to perfect manoeuvres with simple, structured steps without which I don't think I'd have passed my driving test on the first try. 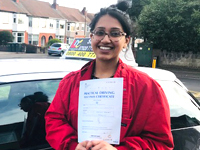 I started off as a nervous driver, but with the constructive feedback Suky gave me and the way she made me feel at ease during lessons, I'm now a confident driver and can't wait to start putting all that i've learnt into practice. 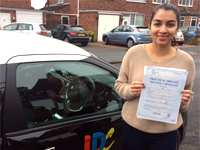 A very big thank you to my Instructor Suky Badhan from LDC driving school for helping me pass. She made it easy to fit lessons around my busy schedule with work and childcare. 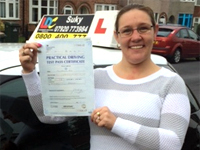 Suky helped me stay positive has helped build my confidence, and has given me a positive attitude towards driving. 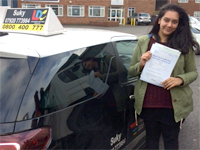 Passed first time with Suky because she is a great instructor, made everything so easy and simple! Definitely the best instructor you can have! She always made me feel confident and never let me feel nervous. She is a great instructor who helps you focus on weak points to strengthen them. Thank you Suky for all the help you have given me! Would recommend Suky to anyone! I'm so glad Suky was recommended to me by multiple successful friends because she helped to calm my nerves and made me a much more confident driver. You can have a laugh with her, but she balances this with valuable constructive feedback. Before I'd even started driving I put it off for so long because I was so nervous, which meant I had to continue lessons during University and Suky was so accommodating. I highly recommend her to all prospective drivers, she was a real help. I’m so glad Suky was recommended to me by a family friend as she is an amazing driving instructor and I could not have passed without her. She knows how to make you feel calm and is really patient when it came to working on my weaker areas. She explained everything step by step when I didn’t understand something at first. 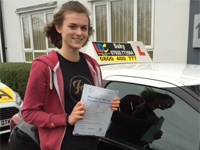 She tailored lessons to what I needed and gave constructive feedback so I felt confident when driving. She is a wonderful, easy going person and someone you can have a laugh with, I would definitely recommend her to anyone looking for a driving instructor. 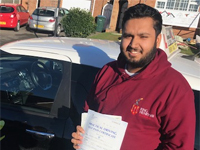 Suky is an excellent driving instructor who caters to your needs and listens to your worries when it comes to driving. She helped me build my confidence and made driving seem easy, which is something I did not feel before learning with Suky. Thank you for all your help. After many challenging experiences with other instructors, and almost giving up on driving entirely, Suky was recommended to me and I am super glad I got into contact with her. Since then, I have become significantly more confident in my driving abilities, due to Suky's excellent teaching skills, as well as, her friendly and calming vibe. Suky gives great advice regarding driving and has all the valuable knowledge needed to be a confident and safe driver. It has been an honour to be taught by her. 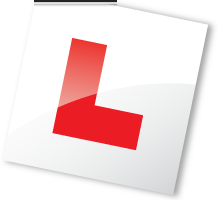 I would strongly recommend Suky as a driving instructor to any current or prospective learner drivers out there. I had already had some lessons before driving with Suky but I was a very nervous driver when I started with her. she has built my self confidence and made me a better driver. With her support and guidance I passed my driving test which is fantastic. I would certainly recommend her to anyone she's a wonderful person and even better instructor. Thankyou so much. A family friend had recommended Suky to me to start learning to drive with her and I’m very glad they did. I was initially very nervous about driving and she put me at ease by tailoring the lessons to what I needed to work on and develop. I never felt rushed or panicked when I made a mistake because Suky was always very calm and gave great constructive feedback at the end of every lesson. 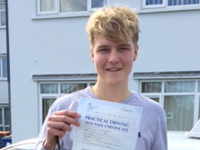 I looked forward to my weekly driving lessons because it was a lot of fun and I always felt like I had improved after each hour. I would definitely recommend her to prospective drivers. Thanks for all your help Suky! Suky is a great driving instructor. She made me feel calm in the car and explained everything very clearly, whilst always being patient with me when I didn’t understand something the first time. She has extensive knowledge of the test routes and showed me lots of the different scenarios that could occur in the test, meaning I felt confident when actually taking it. I would recommend Suky to anyone! Suky is a fantastic driving instructor that calms your nerves while you're driving. I felt confident around her and easily got along with her. The lessons with her are amazing as you never get bored around Suky while you're driving. When it comes to teaching, Suky gives clear instructions and great constructive feedback. I would highly recommend Suky. I would highly recommend Suky as your driving instructor. She is so easy to get along with and helped me gain the confidence and knowledge to pass. Suky was always there if I needed to ask any questions and go over anything. 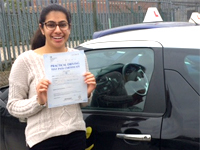 I had a great experience learning with Suky and thanks to her I passed 1st time with 0 minors! 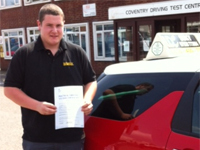 I came to Coventry with a month to prepare before my test and I still passed it first time thanks to Suky. She was great at giving me advice and provided me with the independence which I needed. She gave me useful materials and helped me become a better driver. Thank you for your help. Suky is a great instructor, very calm and a good laugh. Looked forward to every lesson I had. Passed first time in the space of 12 weeks. Highly recommend her. 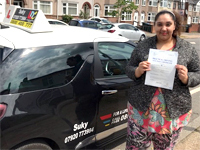 Suky is a great driving instructor she makes you feel really relaxed whilst driving. She talks you through everything and makes you feel confident behind the wheel. If there is anything you don't understand or are struggling with something she will go through it step by step to help you understand. I passed my test with only 4 minors and if it wasn't for Suky I wouldn't have passed at all. She is an amazing instructor and I will miss all our chats :) so thank you again for everything. I really enjoyed the time I spent learning to drive with Suky, it was like driving with a friend I had known for years. 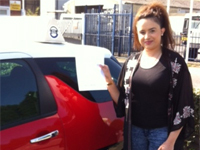 Suky gave me the confidence and skills that I needed in order to pass my test first time. Suky is a lovely, honest, kind and caring woman who wants you to do the best that you can. I appreciate everything she did to help me, it was an honour to have Suky as my driving instructor. 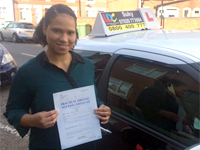 I passed my test after 15 lessons suky was really easy to talk to and explained everything in the best way possible. i had no problems while on my test because everything had been covered. I had one previous driving instructor before Suky who I didn't have much luck. However Suky was brilliant, making you feel at ease in the car when driving. Suky also explains things in a very simple way making it easier to understand. I wouldn't hesitate to recommend Suky to anyone learning to drive. A huge thank you to Suky for helping me pass my driving test. Suky is an amazing teacher. She is very calm, patient and knowledgeable. I felt very relaxed during lessons with her and I was looking forward to each lesson. Suky was very good at identifying my weakest points and explaining how I could improve and where I needed the most practice. She has given me the correct expectations about the practical test. 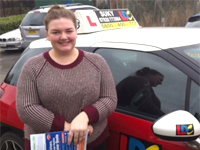 Suky is a very experienced driving instructor and she knows how to prepare pupils for the test. I'm grateful for her teaching and support. I recommend her to all learner drivers.